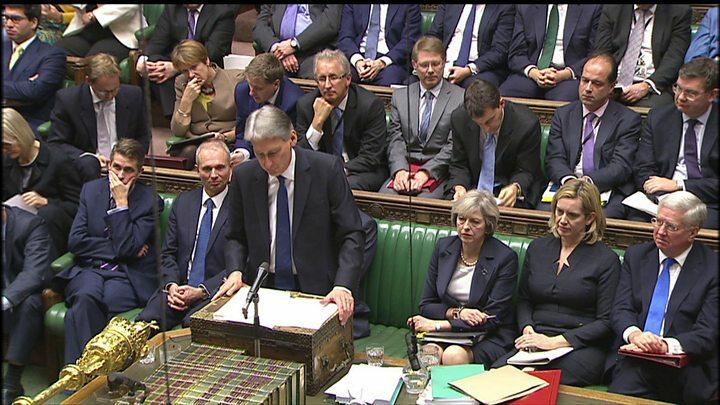 Media captionPhilip Hammond opens his first Autumn Statement by looking at the UK economic figures. The UK economy is "resilient" despite forecasts that government finances will be £122bn worse off than previously expected by 2020, the chancellor said. In his Autumn Statement Philip Hammond said growth predictions had been cut as a result of the Brexit vote. As widely expected, he unveiled a fuel duty freeze and more cash for housing, transport and digital infrastructure. Labour said the government was "unprepared and ill-equipped" for Brexit and had "no vision". Mr Hammond told MPs the UK's deficit would no longer be cleared by 2020 - with the target instead "as early as possible" afterwards. Mr Hammond said the statement - his first major Commons event as chancellor - came exactly five months after a Brexit vote which "will change the course of Britain's history", making it "more urgent than ever" to tackle long-term economic weaknesses. 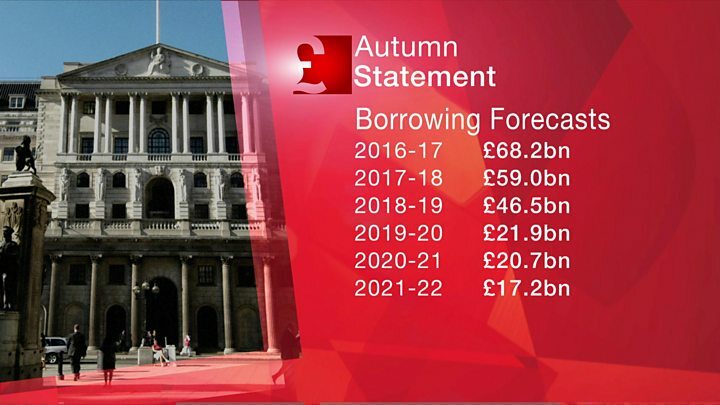 Presenting the Office for Budget Responsibility's forecasts, he said borrowing would hit £68.2bn this year and £59bn next year, compared with the March forecast of £55.5bn and £38.8bn. The OBR said the referendum result meant potential growth in the current Parliament would be 2.4 percentage points lower than forecast in March. Government finances are forecast to be £122bn worse off than in the spring. Mr Hammond said the government would prioritise "additional high-value investment" on infrastructure, which would be funded by additional borrowing. He paid tribute to his predecessor George Osborne but said he would now follow three new fiscal rules: to balance the books "as early as possible in the next Parliament", for public sector net debt to be falling as a share of GDP by the end of Parliament and for welfare spending to be within a cap. 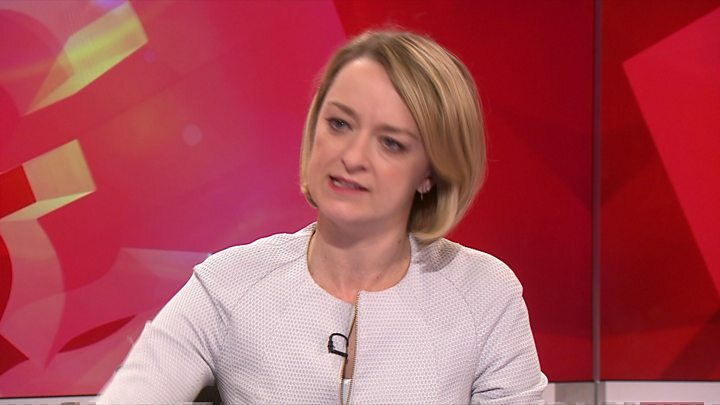 Media captionBBC political editor Laura Kuenssberg on the Autumn Statement. 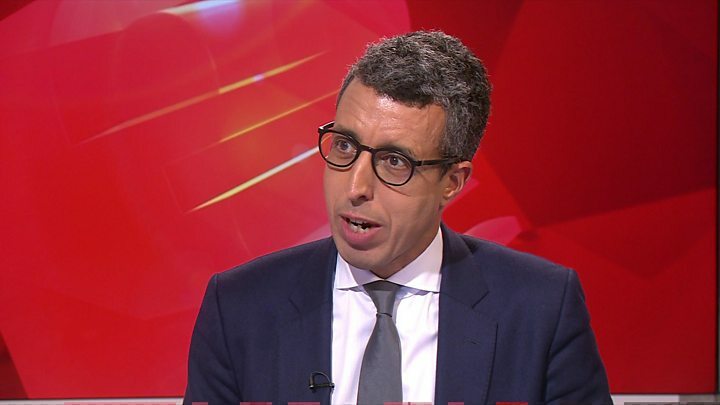 Media captionBBC economics editor Kamal Ahmed on the Autumn Statement. The OBR based its forecasts on the assumption that the UK would leave the EU in April 2019 - two years after the government's deadline for triggering negotiations with Article 50 of the Lisbon Treaty. It also assumed new trading arrangements would slow import and export growth for a decade and that migration would be restricted. It said the increased borrowing would result from weak tax receipts and lower than expected growth predictions as a result of June's vote to leave the European Union. Based on its assumptions around Brexit - the government has not yet revealed the details of its negotiating plan - it predicted the referendum result would account for an extra £58bn of borrowing. This included a predicted £16bn increase as a result of lower migration and £18.1bn because of lower productivity growth. The OBR said its forecasts for Brexit were "uncertain", and they were disputed by Conservative MP John Redwood, who said: "Their forecast probably is too low, their borrowing forecast is far too high, and we'll get good access to the single market once we're out of the EU." The Economists for Brexit group said the OBR had "assumed a pessimistic outlook for the UK economy outside the EU, based on bad economic policy-making". At the end of his speech, Mr Hammond revealed the Autumn Statement would be scrapped in future years, saying there was no need for major tax changes to be made twice a year. Instead, he added to laughter from MPs, there would be a "Spring Statement" where the government would respond to OBR forecasts, and the Budget would take place in the Autumn. It is not clear whether that means there will be two Budgets in 2017. There was no secret that the picture today's Autumn Statement would paint would not be pretty. But more than £100bn of extra borrowing, roughly equivalent to the entire NHS budget - nearly £60bn of that the costs of Brexit - make a brutal backdrop for Theresa May's government as it only just gets going. Remember all the figures ought to be taken with a giant pinch of salt. Forecasts like these have so often been wrong. And no one is forecasting a recession. But what the chancellor said today and the Office for Budget Responsibility has calculated have big implications. The government had already announced an extra £2bn a year for science by 2020, a crackdown on compensation claims for whiplash injuries aimed at reducing motorists' insurance premiums and £1.3bn to improve roads. Changes to Universal Credit - the flagship single payment being rolled out across the UK - will reduce the "taper rate" from 65% to 63%. This means benefits will be withdrawn at a rate of 63p for every pound of net earnings. The government said about three million households would benefit. But the Resolution Foundation think-tank said their gains would be "small fry" compared with previously announced cuts to the work allowance, which is the amount people can earn before they start to lose their benefits. On housing, the government said it would relax rules on how affordable housing funding could be used. It said banning letting agents' upfront fees would help 4.3 million private rental tenants. Citizens Advice welcomed measures on the agents' fees and on workers' wages but said more should be done to help "just-managing families". Labour, which has been calling for agents' fees to be banned, said: "Any change of heart is welcome" but added that the government had "no plan" to fix the housing crisis. Responding to Mr Hammond in the Commons, shadow chancellor John McDonnell said the Autumn Statement placed on record the "abject failure of the last six years". He condemned the government's approach to austerity and said the people the prime minister promised to protect - those who are "just about managing" - had been "betrayed". "After all the sacrifices people have made over the past six years, I fear today's statement has laid the foundations for more wasted years," he added. The SNP said Mr Hammond had offered little on the "elephant in the room" - Brexit - while the Lib Dems said the government would "hit people in the pocket through their hapless handling of Brexit". But UKIP said billions were being wasted by the government "delaying" the UK's exit from the EU. Plaid Cymru said there was little in the statement to help rebuild the Welsh economy and close the wage gap with England. Who is the real Philip Hammond?